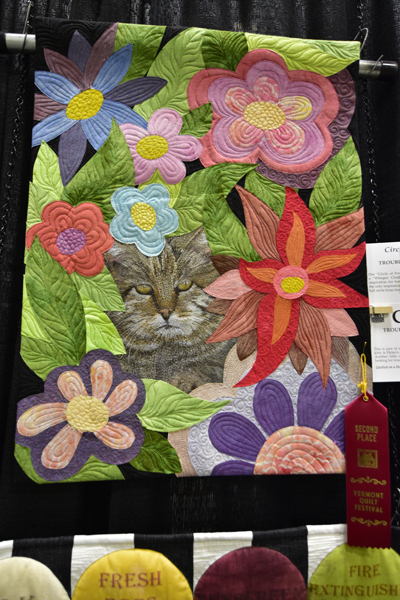 A week ago, last Sunday, my daughter, husband and I went to the Vermont Quilt Festival. It was the last day of the show and so we left early to arrive as the doors opened at 10:00 a.m. It is a tough show to "do" in only one day and we were going to make the most of it! 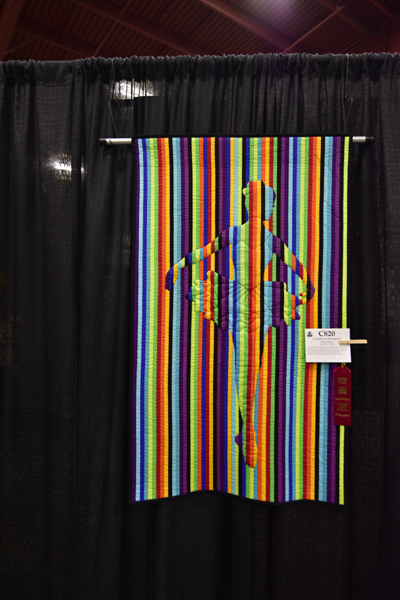 My husband likes to take photos of the quilts for me, so I can enjoy the show all year long on my computer, and he gets to practice his photography skills on subjects worthy of his time! I am going to share his photos so that you can enjoy some of this show as well. Of course, your view of the show through my blogs will be at my mercy, but I hope to do the show justice! This year did not disappoint us! The quilts were exceptional and the shopping too! I will also share my new fabric collection with you. 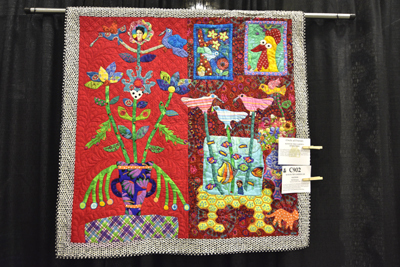 I have been spending any earnings as well as allowances on Kaffe Fasset fabrics and it was so fun to get to shop them first hand at the show, though some were purchased on ebay prior to the quilt festival. They are challenging me to use bigger, brighter and bolder prints. 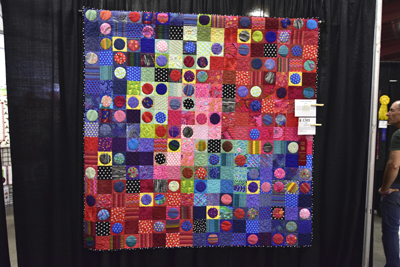 I will have to think outside the box in terms of patterns and use of these bright fabrics this next year, but the quilt show certainly gave me great examples of what can be created with them! 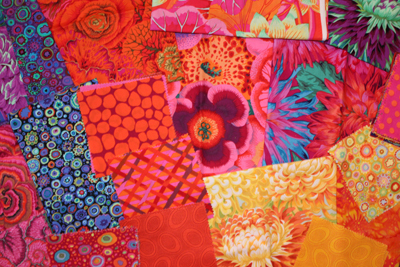 Some of my new Kaffe Fassett fabrics, bright and bold colors! Fun or fun?! 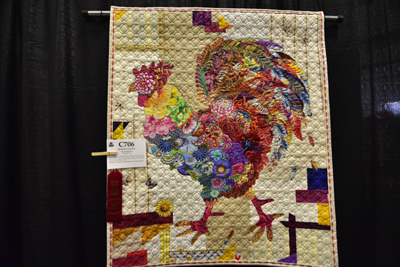 In this blog I will focus on the more wild and artsy quilts we saw at the show. They are super creative! 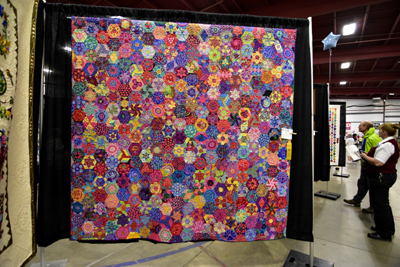 I will post yet another blog to share some of the more traditional quilts with you. All are beautiful works of art! 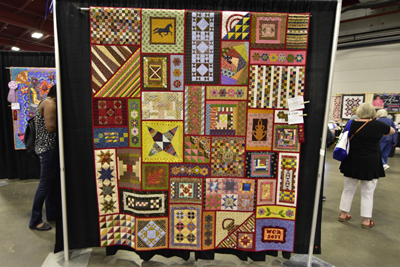 Though I haven't posted blogs in quite a while, I have been very busy sewing and creating quilts of my own and will follow these Vermont Quilt Festival blogs with one to bring you up to date with what has been happening at Little House. 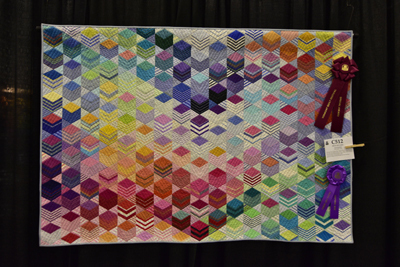 I have just finished two simple comforters that I squeezed in between my other longer term quilt projects, but seeing as how I am not ready to compete with the quilt experts who entered their quilts in the show, I will bring them to you in a separate blog! 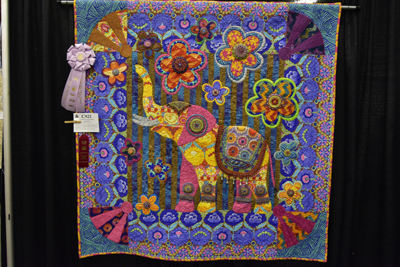 So sit back and enjoy this special selection of wild and artsy quilts. They stretched my brain and maybe they will stretch yours as well? 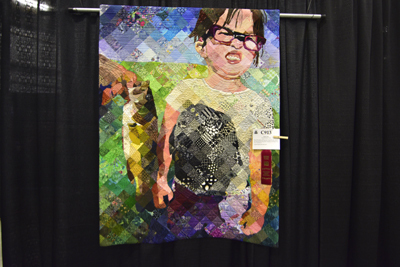 In yet another blog, I want to share with my readers what I have learned from another special quilter I met at the show last year and saw her again at this year's show. She personally shared information and philosophy about her process, much of which I have adopted to fit my own style of creating. I have never been one to create a quilt from start to finish and apparently I am not the only one. There are other ways to create and work on multiple projects. I have followed some of her advice and my quilts are growing rather painlessly. Her style of making quilts is relaxed and sure and allows me to bounce back and forth with different projects. My skills are growing as I work on multiple quilts. I am more patient with myself and am pleased with my quilt production. 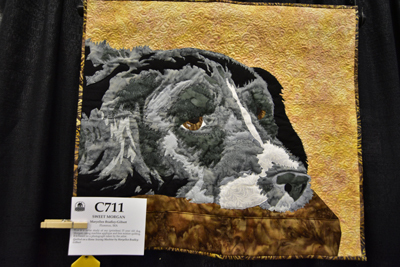 Now for the wild and artsy quilts of the 2018 Vermont Quilt Festival: Please note that if you press "control" on your computer and use the wheel of your mouse, you may be able to take a closer look at the detail in these quilts! Again many thanks to my husband, Tom McMillen for these wonderful photos! creating quite a feast for the eyes! Dot, hand pieced and hand quilted by Susan Painting of Southampton, NJ. make this simple design so beautiful! of Chester, Vt. The Quilting is done on domestic machine. of Essex Jct, Vt. Very colorful and fun wall hanging! Wilma Gatti of Jericho, Vermont. Beautifully designed and stitched! Florence, MA, using a domestic machine. Very sweet indeed! long arm quilting machine to quilt this wonderful wall hanging! taken of a relative! She may think twice before making such a face again? 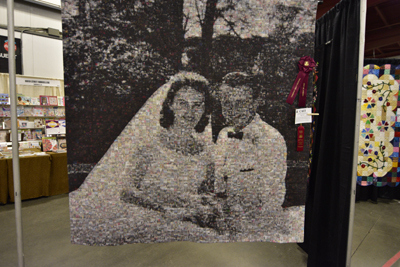 60 Years of Memories, pieced and quilted by Karen Swiech of Ashland, MA. 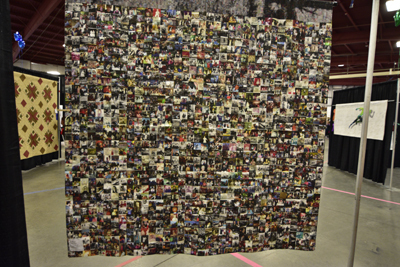 way to save and make a lasting family photo collection! MA, and quilted by Irene Berry using a domestic machine. 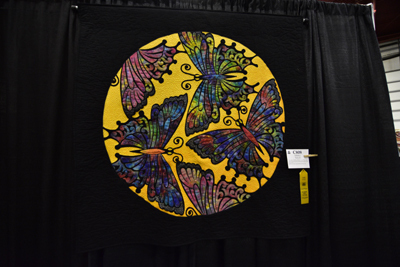 and this one is especially colorful with great detail on the butterflies! colorful and creative, albeit it, simple in construction and design! 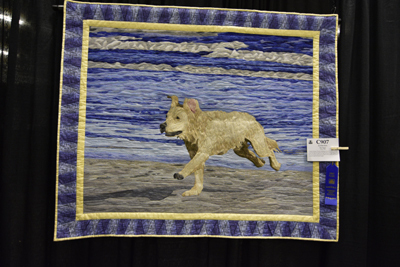 Piece of Cake, pieced and quilted by Ann Feitelson of Motague, MA. creative version of baby blocks quilt pattern, all in the materials used! as it was all about the scrapped quilt blocks not used from previous quilts! might have been thrown out and wasted otherwise! Please return to see my next blog covering some of the more traditionally created quilts. All are so fun!! 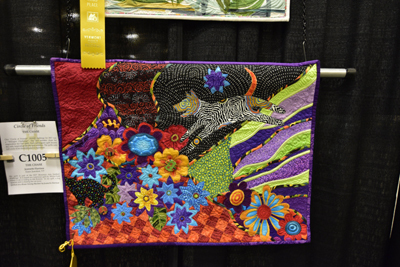 Labels: The 2018 Vermont Quilt Festival's wild quilts, wild=bold and bright and less traditional.